Following in the wake of Dr. Shrinker‘s ode to riff-dense old school death metal, Blasphemer serve yet another timely reminder that things morbid can and should arise from purest metal principles and not misplaced faith in theatrics and gratuitous violence. Death metal has moved progressively away from its roots in speed metal; accordingly the role of the spastic wrist in death metal riff-writing has grown restricted. This is not intended to devolve into a discussion on the pros and cons of speed metal as a style, but to illustrate a simple point; old death metal thrived in equal parts between a tremolo-picking technique which freed the song from rhythmic shackles, AND an intense syncopation between right and left hands, in lock step with that same rhythm section. Over time, the first of these techniques has come to dominate death metal song-writing; the lessons of Slayer and descendants like Deicide and Sinister have been largely forgotten by younger bands, and so it falls to veterans like Blasphemer to keep the flame burning: death metal is not punk, it is a fast, switchback form of music where progression is achieved through the idea of the riff-as-virus, twisting, mutating, infecting all that surrounds it. By happenstance, this style of songwriting is also the reason why counterpoint is pariah to true death metal and far more agreeable with the free flowing, relatively stable melodies of black metal. Death metal is intensely granulated, with a multitude of notes framed against a general backdrop of atonality; conventional counterpoint would be surplus to need and aim in such a setting. 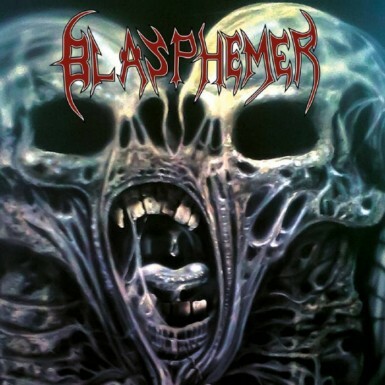 Along with an intense awareness of such things, this Blasphemer album also carries a fine neoclassical flair after the manner of Necrophobic and Luciferion. The result is a richly varied album that occupies a pocket of existence more concerned with nailing a specific aesthetic, ideology, and attitude, than losing itself in rudderless delusions of innovation. This entry was posted in Death Metal and tagged blasphemer, death meta, united kingdom. Bookmark the permalink.